A house built out of waste – is this even possible? Yes it is. At least that’s what the organisation SEED in Rocklands illustrates which I visited on my first week in South Africa. Sustainability in Germany is currently an important issue and since the government decided to shut down the nuclear power plants in 2011 it is now considering the expansion of renewable energy. There are many projects illustrating how to live sustainably “off the grid”. For example there are some villages that have managed it to get all their energy from renewables like wind energy, solar and biogas. But until now I had never seen a project like this. 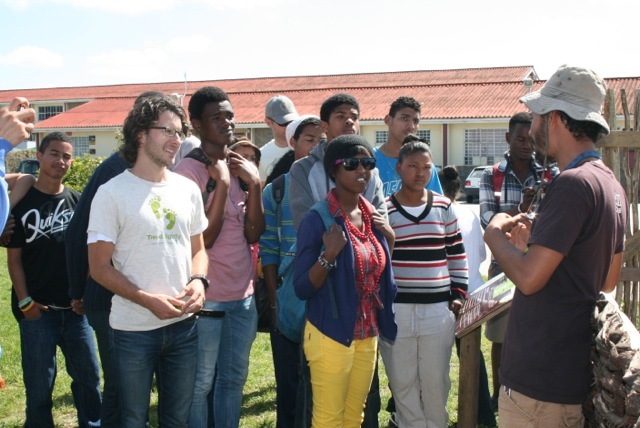 On 8th September, I met the Project 90 Clubs for the first time on a trip to visit SEED at their home in Rocklands Primary School, Mitchells Plain. Leigh and Mickey from SEED welcomed us and gave some introductory information about the project. First Mickey showed us the food garden. He explained that they use companion planting and permaculture, which looks at the overall design of the garden to create a healthy natural system. Mickey’s main role is teaching the children from Rocklands primary school all about the garden and how it operates. 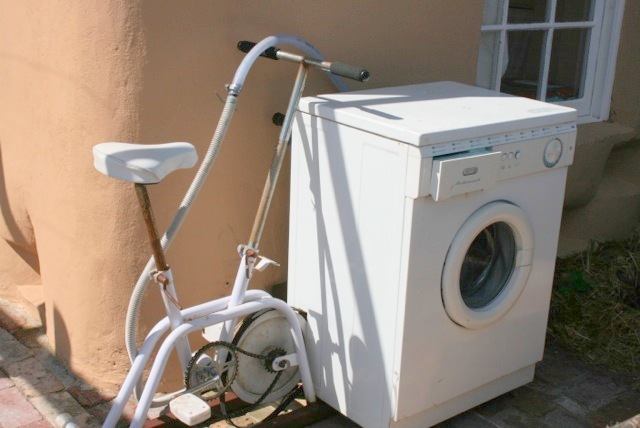 A bicycle powered washing machine. Keeps you fit and clean at the same time! Then we went to the sustainable homestead, which was built from tyres, cement, recycled wooden pallets and tin cans. It is powered only by renewable energy via solar panels on the roof and we learnt how to cook food using a parabolic solar cooker. For me one of the highlights was the washing machine. You have to pedal a bike attached to the drive belt to roll the drum in order to wash your clothes. So that’s the future!? The layout of the Homestead Model is based on the floor size and budget of an RDP house (Reconstruction & Development Programme) – and costs just R80 000 to build. For me it was a very good opportunity to get an insights into the Project 90 Clubs and to imagine how a life without electricity and oil would be possible, in South Africa and in Germany as well. For more information on the home click here. by Sara Lingstaed – Project 90 volunteer. This entry was posted in Project 90, Project 90 Clubs, Sustainable living and tagged Cape Town, Project 90, Project 90 Clubs, Sustainability. Bookmark the permalink.